Few days back a Quiz contest was held regarding PPF account (Public provident fund) and win free Book on our website. The purpose of the contest to create more awareness about the benefits and limitations of Public Provident fund account.Contest was closed on 30/09/13. We have asked 18 questions related to PPF to our viewers .We have received overwhelming response to the quiz and till 30.09.2013 ,2748 Persons have participated in the quiz. First of all we thank all of you to make this effort successful .we hope that all of you continue to support us like this in future also. Results :In most of the questions, majority of persons able to provide correct answers ,however in few tricky question majority of them failed.So overall Results of quiz is surprising , you will be shocked to know that out of 2748 persons participated in quiz, only 18 have answered all of questions correctly .Name of the participant who have answered all the question correctly is given at the End. Answers to the quiz is given below, however if you have not participated in quiz earlier then before going through answers given below you must try quiz first ,PPF quiz is available here and it will take Maximum 2 minutes to participate. 77% of Person prefer to open PPF account in Banks as compare to Post office where only 23 % opted. In quiz 90 % of the contestants are Male and 10% are female. More shocking is that 44 % of participant don’t have PPF account? Four option were given as shown below in the picture .Participant can select more than one option. Answer:The correct answer is Individual resident and out of 2748 ,2701 voted for correct answer .However 8 % persons still thinks that Non resident Indian can also open PPF Account . 4 % also opt of Partnership Firm and rest 5 % opt for company also. Non Resident Indian (NRI) cannot open a new PPF account in India. Prior to 2003, NRIs were not even allowed to make contributions into existing PPF accounts, that is, accounts opened before they became NRIs. However, in 2003, a notification (MOF (DEA) No GSR 585 (E) dated 25.7.2003) was issued permitting NRIs to continue investing in existing PPF accounts till maturity. An NRI can now invest up to Rs 70,000 per financial year in an existing account, that is, an account that he opened prior to becoming an NRI. Further Please note that HUF is also not allowed to open/maintain PPF account. Question-2 Whether PPF a/c in the name of Minor children be open ? Answer -Yes, PPF account can be opened on Minor's name. In Quiz ,25 % person still opt that PPF account can not be opened on minor name. Other point regarding opening of PPF account on Minor's name is given below. Question 3: What is the Minimum term of PPF account . Answer :Minimum term of PPF account is 15 years . 80 % person selected correct answer ,however 12 % opts for 6 years as correct answer and 6 % for 10 years and 2% go for 20 years. Question 4: What is Minimum amount required to be deposited in PPF a/c yearly ? Answer: Minimum amount required to be deposited in PPF accounts yearly is Rs 500. Person can however deposit subscription in multiples of Rs. 5 at a Time. 74 % person also selected Rs 500 ,however 16 % selected Rs 100 and 10 % selected Rs 1000. 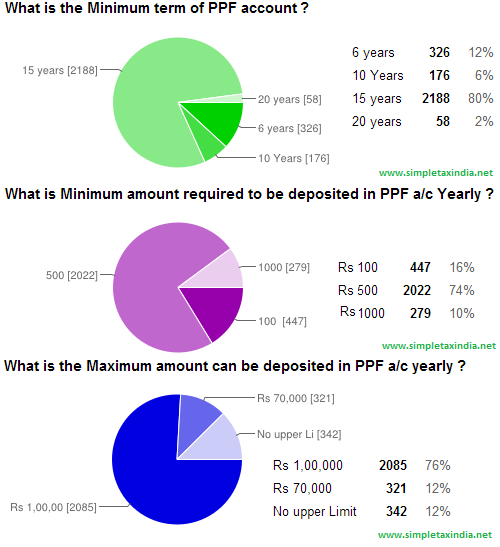 Question 5: what is Maximum amount which can be deposited in PPF a/c yearly . Answer :Maximum amount that can be deposited in PPF account in a years is Rs 1,00,000. Further ,If your minor child has a PPF account, the combined limit for both accounts will be Rs 1 lakh. Don't invest more than the Rs 1 lakh in a year, because if it is discovered, any interest earned by the excess amount will be reversed.Earlier this limit was 70,000 but this upper limit of PPF has been increased wef 01.12.2011 to Rs 1,00,000.Limit has been further Increased to 1,50,000 wef Fy 2014-15. 76 % participant selected correct answer .However 12 % thinks 70,000 is correct answer and 12 % opt that there is no upper limit of investment in PPF account. 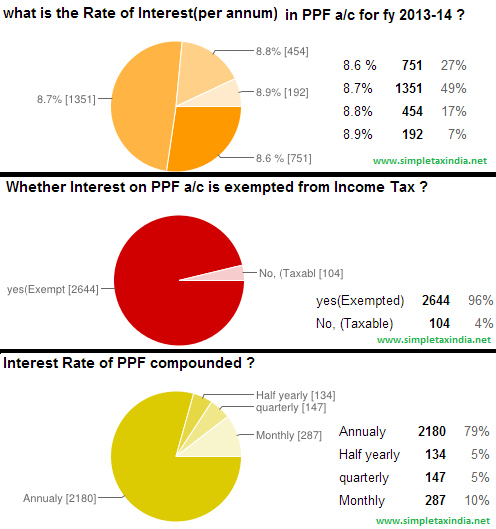 Answer : Interest rate in PPF account for Financial year 2013-14 is 8.7 % per annum. 49 % opt for 8.7 % ,27 % for 8.6 % 17 % for 8.8 % and 7 % opt for 8.9 %. The interest rate offered on the PPF is no longer fixed, but linked to the market. It is 0.25% above the 10-year government bond yield. This does not mean that the rate will change on a day-to-day basis. It will be announced every year in April, based on the average bond yield in the previous year. For the current financial year, it is 8.7% . Question 7 :whether interest on PPF a/c is exempted from Income Tax ? 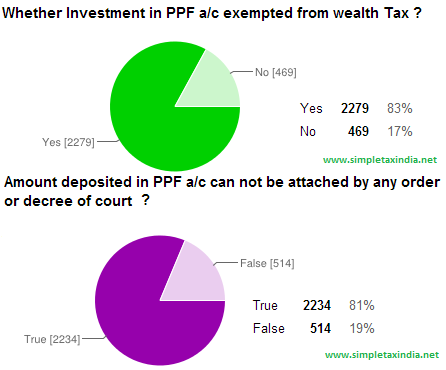 Answer: As opted by most of the participant (96%) ,interest on PPF account is exempted from Income Tax . Question 8 :Interest rate in PPF account compounded by which interval ? Answer :The interest on your PPF balance is compounded annually, but the calculation is done every month. The interest is calculated on the lowest balance between the fifth and last day of every month.So, if you invest before the 5th, the contribution will earn interest for that month too. Otherwise, it's like an interest-free loan to the government for a month. If you are investing through a cheque, make sure you deposit it 3-4 days before the cut-off date. If your bank is lethargic in crediting the amount to your PPF account, your investment might miss the deadline.Amount in PPF account is credited on the date of cheque clearance and not on date of check tendering . Question 9: Whether Investment in PPF a/c are exempted from wealth Tax ? Answer : Yes , PPF investment is exempted form wealth Tax . 83 % answered it correctly. Question 11: How Many times a person can deposit amount in PPF a/c in a Year? Answer : A person can deposit amount in PPF account 12 times in a year . Further 12 times in years does not mean once in a month, so you can deposit more than once in a month but in total 12 deposit entries allowed in a year. 61 % participant opted for correct answer 12 times in a Year. 34 % participant opted for any number of times ,2 % for 4 times in a year,3 % twice in a year. 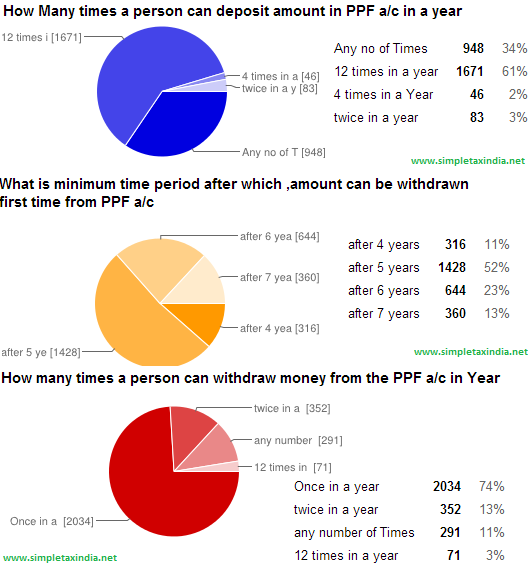 Question 12: what is the Minimum time period after which amount can be withdrawn first time from PPF account ? Answer :Any time after the expiry of five years from the end of the year in which the initial subscription was made, you become eligible to withdraw an amount of not more than 50% of the previous year’s balance or of the 4th year immediately preceding the year of withdrawal, whichever is less. If you have taken any loan on your PPF, this also gets factored in and reduces your balance. As the correct answer is 5 years completed from the end of the Initial subscription year,and option available are both "after 6 years" completion and "after 5 years" completion ,so we are decided to give credit to person who have selected either "after 6 years" completion or "after 5 years"in their answers. Question 13 : How many times a person can withdraw money ? Answer :You can make only single withdrawal in the year. You need to apply with Form C for any withdrawals.So it is major drawback of the PPF account. 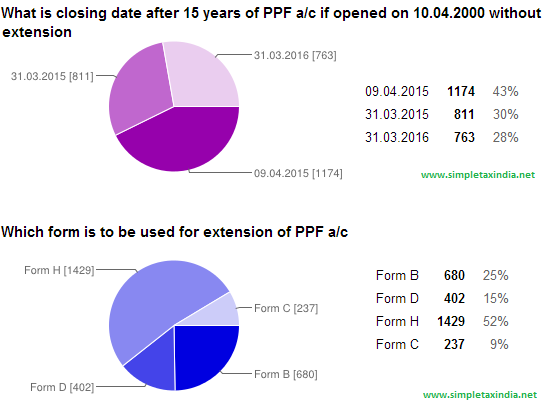 Question 14 :What is closing date after 15 years of PPF a/c ,if account opned on 10.04.2000 without extension ? Answer:In PPF account ,15 year period is to be considered from the end of financial year of initial subscription . In given question end of initial subscription year is 31.03.2001 and 15 years from 31.03.2001 ends on 31.03.2016 ,so correct answer is 31.03.2016. As the question was tricky ,so most of the person have given wrong answer and only 28 % managed to give correct answer. Answer :Form H ,48 % of participant also opted incorrect answer for this question. 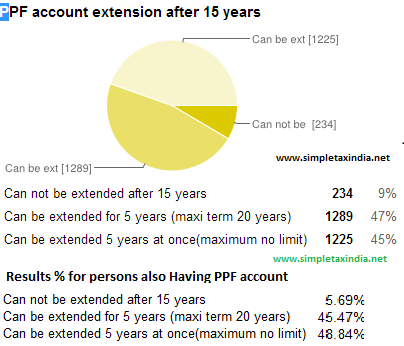 Question 16 :PPF account extension after 15 years. Answer :You can extend your account by a 5 year block, as many times as you want.But only 45 % persons can only provide correct answer. Most shocking is that more than 51 % of persons having PPF account does not know that they can extend the PPF account without any Limit. He can extend the account without making any further contributions, and continue to earn interest on it every year. 53 % Persons select the correct answer ,However 48 % of the persons who have also have PPF account have also selected wrong option. If you decide to withdraw your money, your maturity value is exempt from tax. you can also make withdrawals from the account, up to 60% of the account balance that was there at the beginning of the extended period. If you choose to extend your account, submit the necessary documentation for extension before one year passes from the maturity date. If you choose to extend your account without making any fresh contributions, you can do so. In this case, any amount can be withdrawn without any restriction; however you can only withdraw once per year. The balance will continue to earn interest till it is withdrawn. If Investor select extension of PPF account without further subscription for a block of 5 years then he can not opt for extension with subscription. Answer :Correct answer is all of above option ,But most the person not able to reply it correctly and Married daughter's Option was selected by only 3 % of the Persons. Due to this question the number of correct entries has reduced so much. So Individual can deposit PPF amount in following persons account to claim 80C benefit. So for deduction under section 80C can also be claimed on married daughter's account (dependent or not) as Income tax act has used word "any child of Individual " and it does not have any difference whether child is Son or Daughter ,Major or Minor ,Dependent or Not dependent and Married or not married. Note : Kindly comment on results and how successful we are in our effort to educate peoples about PPF rules ,Further please point out errors ,if any . Regarding the maximum amount that can be invested in PPF you have mentioned that it is Rs 1 lakh across all accounts (self and kin). But I have got differing opinions on this question. I have heard from more than one CA that a person can deposit Rs 1lakh in his/her name and additionally invest Rs 1 lakh each in his kin's (minor) account. So can you confirm that your statement is correct? Can you quote the phrase in the law/Act that justifies your statement? It mentions maximum of Rs 1lakh in each of the account which means if I have opened an account in my name and an account in my son's name then I can invest maximum of 1lakh in each of the account and earn tax free interest.
" deposits in excess of Rs. 1,00,000 made during a year "
So I think this article needs to be rectified w.r.t maximum amount for the sake of your readers like me. If you still feel that above article is correct and does not need rectification please quote PPF Act which justifies the answer mentioned in this article. "5) An individual can open a Public Provident Fund Account in his own name. He can also open an additional account on behalf of a minor of whom he is guardian. He can subscribe any amount in multiples of Rs. 5/- of not less than Rs.500/- and not more than Rs.1,00,000/- in a year in each of his account. A year for the purpose of the Scheme means a financial year (1st April to 31st March). The deposits in excess of Rs. 1,00,000 made during a year will not carry any interest and will not be eligible for rebate." As per PPF scheme rule 3 reporoduced hereunder .The upper limit is fixed on Individual and not on each account ." "Any individual may, on his own behalf or on behalf of a minor of whom he is the guardian, subscribe to the Public Provident Fund (thereafter referred to as the fund) any amount not less than Rs. 500 and not more than Rs. 100,000 in a year." nicely presented. surely be benefited to people. Thanks for the snippet from PPF Rule 3.. If I read the rule, I don't see it saying the cumulative account across all deposits should be maximum of Rs 1 lakh. To me it indicates that the maximum limit per account (whether the account is on his own behalf or on behalf of minor) is Rs 1 lakh and not cumulative. Also if your interpretation is correct than it means that the bank's interpretation is wrong. Do you atleast agree to this? Fine with agreeing to disagree. We might disagree on interpretation of your quotation of PPF Act phrase. But I am surprised to see that you are not ready to agree what SBT site is saying, when SBT website clearly and Explicitly states that limit is per account. is it possible to close the PPF account before maturity??? I wanted to start a PPF on my father's name who is 56 years old. Is it possible? what is the maximum age limit for opening a PPF account? Thank you for the reply! this helps!